CONSTABLE WHIPPY TO THE RESCUE! It is rare to get a laugh from the news in Northern Ireland, so when a humorous item does arrive on the scene I think that it is important that we cherish it – particularly one which pricks the balloon of humourless political correctness. Because of the daily grind of deadly seriousness over the years of the Troubles and the “peace process” we have lost, or at least misplaced, the ability to laugh at ourselves. I think that this particular news item is so refreshing, I believe that it should be sent to the blog. 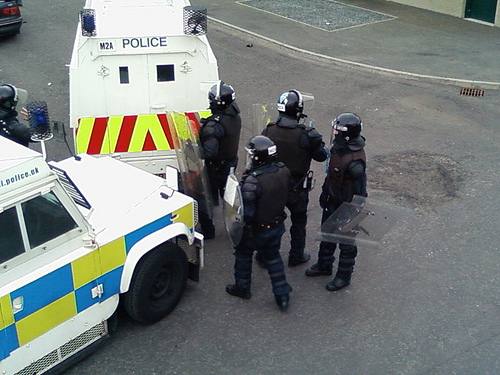 On Saturday 22 May the outfit formerly known as the RUC, the now more politically correctly-named Police Service of Northern ireland (PSNI) were called out to deal with rioting on the nationalist Twinbrook estate in West Belfast. As they passed a group of about 15 youths, the latter began throwing bottles and other missiles at the police landrover. The police officer in the vehicle then played ice-cream van music over the tannoy system in an effort to use humour to defuse the situation – and it worked! 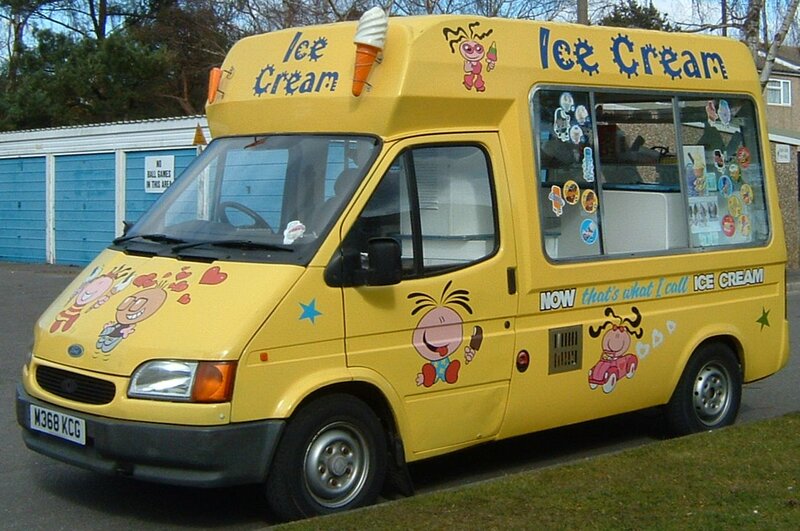 Somewhat amazingly, the PSNI have now “admitted” that it was inappropriate to play ice-cream van music in such a situation. I believe that the officer who carried out the action should not only receive commendation for his cool, clear and quick thinking, but also be recommended for further study and an educative post in crowd control methods. I have seen in certain TV programmes how venues for underage drinking, drug taking, and anti-social behaviour in England and Scotland have been rendered “off limits” by the simple expedient of having classical music played for a number of hours in the evenings and at night. No “yoof” who wants to lose his/her street cred will want to hang around a joint like that. No-one is hurt, anti-social behaviour is prevented, and because classical music is educational and cultural, the human rights brigade have nothing to complain about. “The PSNI are put on the streets to do a serious job and that is to keep order on the streets and face down antisocial elements. I beg to differ, Angela. The only sick joke is your chronic lack of a sense of humour and your clear inability to perceive the irony in this situation. It reminds me of the comments of Soviet leaders on the West before Gorbachev came along. Had the PSNI lashed out with batons or used taser guns would you have been satisfied then? I guess probably yes. As it was, the police handling of the situation provided no solid grounds for complaint from the usual suspects, and that is why it is sticking in some people’s throats. I believe that if the PSNI have discovered a truly novel way of diffusing tension on the streets, then its effects are worthy of further study. 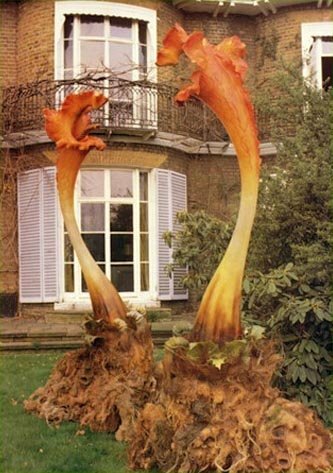 Return of the giant hogweed -"Botanical creature stirs seeking revenge..."
My short-lived experiment with vegetarianism came to an end quite some time ago. I nevertheless made the effort to try and understand the mind-set of a vegetarian. I can see for instance why one might treat the idea of eating red meat with revulsion. One can develop an attachment to a mammal, particularly if its raised from an early age. Cattle and pigs especially can be friendly creatures. 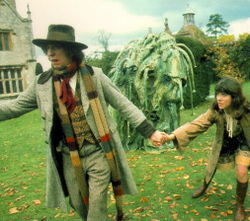 In fields, they will often come up to the gate to greet you. Sheep on the other hand stare at you passively and zombie-like, then continue to graze as if oblivious to their own existence. And leaving aside the welfare the animal in question, there is also the welfare of one’s arteries and heart at stake here. No pun intended. Fish, however is a different story. To my knowledge it’s impossible for a human to have any emotional bond with a fish. OK, there are ethical reasons, such as principled opposition to overfishing, but if one boycotts certain threatened species this problem is solved in one fell swoop. The health reason argument here is a no-brainer. OK, then lead and mercury contaminants in polluted seas enterig the food chain is a valid point, but think of the essential omega 3 oils and various vitamins, etc you get from oily fish like mackerel and herring. Despite all this, I certainly eat less meat than I used to. Ironically though I am making a conscious effort to eat more fish. I’ve even started to use vegetarian mincemeat substitute for spaghetti bolognese. It’s nowhere near as good as the real thing of course, and lacks in taste, but at least it’s filling. I’ve also got into salads more. So while I would admit that vegetarianism can be quite a noble pursuit in the interests of health and ethical concerns my problem is that roast lamb or beef, good quality ham or bacon just tastes too damn delicious to give up. In order to be a committed vegetarian it probably helps immensely if you don’t like meat in the first place. So while I could never envisage becoming a full time vegetarian (unless for health reasons I was forced to), I still feel it does no harm to reduce one’s meat consumption to a minimum. Over the last few weeks I’ve been dabbling with semi-vegetariansim (“semi” that is I still eat fish). It’s partially for health reasons and partially as a challenge to see how long I can go without meat. If nothing else it’s also a useful excercise in self-discipline. I don’t think I could ever give up meat permanently though, unless forced to under strict doctor’s orders. The thought of never again having roast lamb and mint sauce or chicken as part of a Sunday roast or forgoing the Christmas turkey and ham would fill me with dread. But recently I’ve been forsaking the usual lunchtime ham in my sandwiches for hummus and red peppers or cheddar with onion relish, tomatoes and red onion. Instead of beef or bacon in my pasta sauces I’ve been using celery, aubergines, courgettes carrots and peppers. While it hasn’t been terribly difficult to avoid meat, the food does come across a tad blander without it. I’m not into the meat substitute products like bean burgers or quorn mince though as for all you know what kind of chemicals and crap are in them, you’re probably just as safe eating proper meat. If you’re going veggie you might as well eat real vegetables. With all the recent scares stories about BSE, battery hens, meat pumped full of hormones and mercury levels in tuna, it’s not surprising that many people have gone down the vegetarian route. But if we knew where the meat came from and could follow its route from bull to beef, pig to bacon knowing it had been reared in natural conditions and free of additives there wouldn’t be a problem. That is if you’re abstaining for health reasons. Then on the far side are those militant vegetaran types who believe it’s unethical to farm animals in the first place. A bizarre position to take when you consider the idea of cattle, sheep and pigs running wild around the country. John Cleese was supposed to have said something along the lines of “If God didn’t want us to eat animals he wouldn’t have made them out of meat”. He’s got a point. But for the time being I’ll suppress my carnivorous desires. After all Christmas isn’t too long to wait for that turkey drumstick or succulent slices of ham spiced with cloves and honey.